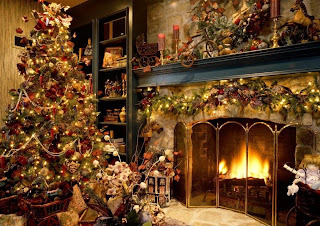 To all of my family, friends, and readers, I wish you a very Merry Christmas! Madoff Comes Clean - I am all about telling the truth in financial matters, but the revelation the Bernie Madoff had a $50 billion Ponzi scam was too much. In a year when investors are already not trusting the stock market, something like this is just plain absurd. The problem here is that Madoff's firm held the money, invested the money, accounted for the money, and sent the statements. He was the advisor and broker-dealer. The SEC just fell asleep here. Investing - I have recently heard from some neighbors that were questioning whether to ever invest again. I think that the interesting thing here is that most of them have benefited from the growth of the stock market, and now, they want to change that mind set. When I discussed many items with them - 401(k) investing, stock options, company matching of 401(k) contributions, and the lack of return on money markets and CDs - they suddenly decided that we must indeed still invest in the market, but we must "fix" it. As someone that loves history, I have gone back through everything that I can find, and the issues of 2008, may indeed end up being a positive. If we go back and look at the problems of the late 70's and early 80's, there was a drastic need of change. Inflation was absolutely out of control. Fed Chairman Paul Volcker set out to get it back under control by raising interest rates to unheard of levels. The "prime rate" for the best borrowers hit 20% - compare that to 3.25% today. This action killed the economy, but it brought inflation under control, and it helped lead to the "bull market" of the late 80's and 90's. What is interesting here is that this was the last time you could have your money in CD's and actually get a decent rate of return (15%+), but with inflation at 18%, you were still losing money. The main thing I am trying to point out is that the problems of today should be resolved within a short time period. This is not to say the stock market will go straight up, but if the financial system and economy can be "realigned," the country and world economy should start to be back on track. If you remember my last post, all of the programs that came about after the Great Depression - FDIC, Unemployment, Medicare, Social Security, etc. - were in response to that financial turmoil. These are all things that have now benefited the citizens and economy currently. It has been a tough year in the markets, but with negatives can come positive adjustments. The housing markets and mortgages will be fixed, the financial system restabilized, the automakers (hopefully) revamped, and a system that will benefit both the free markets and government sectors. If President Elect Obama does come in and spend money on education, it will be a positive both today in terms of jobs and funding, but additionally in the future with better equipped children. Educators are at the forefront of society literally making a difference day in and day out, and there must be a system in place to allow them to continue to succeed. I wish your families and you a Safe and Happy Holiday season and a prosperous Happy New Year! Over the past few months I have talked with many clients and educators about various financial matters. From questions regarding investing to pensions to annuities to savings accounts, and it is from these discussions that I have learned a great deal that I wish to share. Being an avid history buff, it is interesting to me that the group of people that seem to be least worried about the market fluctuations are those in their late 70's and older. In talking to them, they stress that this is nothing like the "Depression" that is "talked about on the news." When I ask them what they think, they let me know that things have come full circle. From humble beginnings where family and friends helped each other with the necessities of life to the growth of materialism... and now back to the little things. I think that is sometimes lost on many of us. The have pointed to the change in government programs from prior to the Great Depression. There was not a FDIC guarantee at your bank for the your account. When a bank went under, your account was gone. Now we have $250,000 guarantees at FDIC banks. Social Security was non-existent. Now it is an important part of your retirement benefits. Medicare/Medicaid was not even a thought until the 1960's. Unemployment benefits started in 1935. While some would argue whether these programs are run efficiently, they are still better than nothing. Imagine waking up tomorrow morning, and finding out your checking and savings accounts are gone. A "run on the bank" was a real and ever present danger until the government backed the banks. No one event or program will move us from our current economic situation back towards a "normal" growth pattern, but if you look at the various moves by the Federal Reserve, U.S. Treasury, Bush administration, Congress, and proposals by the soon to be Obama administration, things are in the works. Just the various rumors about the stimulus proposals by Congress for a package that promotes revamping the infrastructure of the U.S. is promising. If it is implemented with speed, it will mean immediate jobs throughout the country on items that must be done and will take months and years to complete. This is just one of the many ways that we will start the growth cycle again. I wrote today's blog simply to explain that while the current times may look bleak, our country and economy has weathered and grown through many trials. From these previous trials, we have learned, adapted, and anticipated some of these issues. Changes will be implemented after this latest trial, and if history is any judge, we will be the better for it. Next time, back to more educator issues. On Wednesday, the TRS Board voted unanimously to REJECT a proposal to change the semi annual Cost Of Living Adjustment (COLA) for retired Georgia educators. The proposal was to allow a Board vote annually on the amount of the COLA for the following year. The 40 year history of the current guideline has a 1.5% increase in January and an additional 1.5% increase in July every year as long as the CPI for the previous year was positive. Additionally, a letter from the Georgia attorney general's office said that Georgia could potentially be held in breach of contract if the proposal was approved. Assistant Attorney General Christopher McGraw wrote that the state would probably have a tough legal battle if the long-standing policy was changed. A HUGE WIN FOR GEORGIA EDUCATORS!!! I have written often about the problems associated with 403(b) accounts. I am definitely for having a retirement vehicle, but many times the educator is the one that gets taken advantage of by paying large fees that are usually hidden. On Wednesday, Robert Powell of MarketWatch wrote an article that I would like to share. This is not to scare anyone into NOT opening account, but depending on the county and the custodians available, PLEASE be careful with your choices. While I do not agree with all of the information below, I definitely agree that you should know and understand what you are signing up for. I want everyone to prosper rather than just be steamrolled into a 403(b) account that hits the employee with huge fees. BOSTON (MarketWatch) -- Come Jan. 1, more than 10 million American workers who save for retirement in 403(b) plans may not be so eager to hear the phrase "Happy New Year." As a result of a government regulation that becomes effective next year, many employers who sponsor 403(b) plans will likely reduce the number of providers and investment choices in their plans, as well as put in place restrictions on loans and hardship withdrawals. That could be a headache for the workers at many hospitals, schools and nonprofit organizations affected by the new Internal Revenue Service regulation. To be fair, the new IRS rule, the first of its kind in 40 years, is designed to make 403(b) plans look more like 401(k) plans. Up until now, 403(b) plan participants had in some ways much better deals than those with 401(k) plans: They could invest their money with many different vendors and they could take out loans and withdrawals without having to go through their employer. It was, to some observers, a Wild West atmosphere, with some employees essentially managing their own plans. But now the Wild West is getting tamed. To be in compliance with the new IRS regulations, 403(b) plan sponsors need to have several documents and agreements in place just like employers who sponsor 401(k) plans. Employers will need a written document that provides a summary of its 403(b) plan and identifies the approved list of vendors, eligibility rules, contribution limits, loan rules and limits, and distribution and withdrawal rules, among other things. Some financial advisers say employers may not have the expertise in place to create such documents. Still, many existing 403(b) providers, including TIAA-CREF, the nation's largest 403(b) plan provider, are giving employers model plan documents to use. Employers also need recordkeeping and information-sharing agreements in place with their 403(b) vendors. As part of their new fiduciary responsibilities, employers must keep track of their workers' money inside the 403(b) plan. With the information-sharing agreement, employers will be assured that vendors are sharing information among themselves about participants' hardship withdrawals, loans, and transfers. But some 403(b) firms are not able or willing to meet the terms of the information-sharing agreements that employers plan to use, said Aaron Skloff, chief executive officer of Skloff Financial Group. And that could result in some 403(b) providers exiting the business or reducing their presence, leaving workers to re-arrange their contributions into different funds and products. "Thousands will lose their choices," Skloff said. To be fair, not all 403(b) plan participants will be scurrying. "The changes will be transparent," said Angie Kyle, a vice president at TIAA-CREF. But Skloff and other advisers foresee big disruptions in the 403(b) world. "These new regulations do not benefit anyone, at least in the short term," said Scott Dauenhauer, co-author of "The 403(b) Wise Guide" and owner of Meridian Wealth Management. "They hurt employers, employees and vendors." Dauenhauer said employers don't have the time, expertise or money to implement the new regulations, employees face the possibility of losing low-cost and no-load investment options in their plans, and the vendors are spending "a lot of money trying to interface with district and third-party administration's information-sharing systems." Given all the turmoil and confusion, employers and associations are pelting the government with requests to delay the effective date. The IRS may announce its plan early next month and many are hopeful they will get relief. But no matter whether the new regulation goes into effect Jan. 1 or some later date, many 403(b) plan participants will ultimately have to make some decisions about their retirement plan. What should 403(b) plan participants do when the time comes? Participants should read closely the summary plan document, Skloff said. Participants should "pay close attention to the new 'approved vendor' list and look for a low-cost vendor," Dauenhauer said. "In all likelihood there will not be one," he said. "If there is not, sometimes the high-cost vendors have a [low-cost] product that they don't like to talk about, but will offer if asked." For instance, he suggested that participants in the National Education Association's endorsed 403(b) plans should ask for the Valuebuilder Direct from Security Benefit or the similar low-cost product from AIG, two of the approved vendors. For her part, Kyle noted that many plan sponsors are attempting to choose low-cost vendors, but that it's important for employee and employer to look at the "whole picture" and compare the breadth of services to the cost. Though many third-party administrators (TPAs) will suggest otherwise, 403(b) plan participants don't have to transfer their existing balances to a new provider. "There is no requirement to do this," said Dauenhauer. "Agents that work for TPAs that are really product sales organizations may attempt this ploy. If, however, a plan participant does decide to move their assets [for the right reasons], it has to be to a newly approved vendor." Those TPAs that are just "product sales organizations in disguise," Dauenhauer said, may give compliance services for free to employers in exchange for access to the employees to sell their high-cost, high-commissioned products. "These TPA's should be avoided by (school) districts." Plan participants should be active in helping the employer make the right decision, but should be careful that they don't end up promoting a union product that is expensive, Dauenhauer said. In the wake of the announcements by AIG of a restructuring of its loans from the U.S., I did quite a bit of research to actually see if there are any negatives to the changes. From independent analysts and company spokesmen, I could find none. According to an interview of Mr. Liddy I saw on CNBC on Monday, the restructuring allows AIG the ability to repay the loans over 5 years instead of 2 years, and it gives it much more flexibility in the pursuit of liquidating some assets (including the VALIC arm). There is no material change to the company or its issues, thus the changes are not anything a consumer would necessarily ever see. Additionally, I did receive an e-mail from AIG on Monday morning with two press releases. I am posting the first regarding the restructuring of the loans. The second press release pertained to the earnings of AIG and is not necessarily relevant. NEW YORK, November 10, 2008 - American International Group, Inc. (AIG) today announced agreements with the U.S. Treasury and the Federal Reserve to establish a durable capital structure for AIG, and facilities designed to resolve the liquidity issues AIG has experienced in its credit default swap portfolio and its U.S. securities lending program. Edward M. Liddy, AIG Chairman and CEO, said these agreements are a dramatic step forward for AIG and all of its stakeholders: "Today's actions send a strong signal to our policyholders, business partners and counterparties that AIG is on the road to recovery. Our comprehensive plan addresses the liquidity issues that threatened AIG, and gives us the financial flexibility to complete our restructuring process successfully for the benefit of all of our constituencies." Liddy continued, "The $85 billion emergency bridge loan was essential to prevent an AIG bankruptcy, which would have caused incalculable damage to AIG, our economy and the global financial system. Thanks to decisive action by Congress, Treasury and the Federal Reserve, there are now additional tools available to create a durable capital structure that will make possible an orderly disposition of certain of AIG's assets and a successful future for the company. Our goal is to repay taxpayers in full with interest, and emerge as a focused global insurer that will create meaningful value for taxpayers and other stakeholders." Preferred Equity Investment: The U.S. Treasury will purchase, through TARP, $40 billion of newly issued AIG perpetual preferred shares and warrants to purchase a number of shares of common stock of AIG equal to 2% of the issued and outstanding shares as of the purchase date. All of the proceeds will be used to pay down a portion of the Federal Reserve Bank of New York (FRBNY) credit facility. The perpetual preferred shares will carry a 10% coupon with cumulative dividends. Revised Credit Facility: The existing FRBNY credit facility will be revised to reflect, among other things, the following: (a) the total commitment following the issuance of the perpetual preferred shares will be $60 billion; (b) the interest rate will be reduced to LIBOR plus 3.0% per annum from the current rate of LIBOR plus 8.5% per annum; (c) the fee on undrawn commitments will be reduced to 0.75% from the current fee of 8.5%; and (d) the term of the loan will be extended from two to five years. The extension of the term of the loan will give AIG time to complete its planned asset sales in an orderly manner. Proceeds from these asset sales will be used to repay the credit facility. In connection with the amendment to the FRBNY credit facility, the equity interest that taxpayers will hold in AIG, coupled with the warrants described above, will total 79.9%. The one-time transactions involve the creation of two financing entities capitalized with loans from AIG and the FRBNY. These entities will purchase assets related to AIG's U.S. securities lending program and Multi-Sector Collateralized Debt Obligations (CDOs) on which AIG has written credit default swap (CDS) contracts. The entities will collect cash flows from the assets and pay interest on the debt. FRBNY and AIG will share in any recoveries in the market prices of the assets. Resolution of U.S. Securities Lending Program: AIG will transfer residential mortgage-backed securities (RMBS) from its securities lending collateral portfolio to a newly-created financing entity that will be capitalized with $1 billion in subordinated funding from AIG, and senior funding from the FRBNY up to $22.5 billion. After both amounts have been repaid in full by the financing entity, the parties will participate in any further returns on RMBS. As a result of this transaction, AIG's remaining exposure to losses from its U.S. securities lending program will be limited to declines in market value prior to closing and its $1 billion of funding. This financing entity, together with other AIG funds, will eliminate the need for the U.S. securities lending liquidity facility established by AIG and FRBNY in October, which had $19.9 billion outstanding as of November 5th. Upon repayment to all participants, AIG will terminate its U.S. securities lending program. Reduction of Exposure to Multi-Sector Credit Default Swaps: AIG and FRBNY will create a second financing entity that will purchase up to approximately $70 billion of Multi-Sector CDO exposure on which AIG has written CDS contracts. Approximately 95% of the write-downs AIG Financial Products has taken to date in its CDS portfolio were related to Multi-Sector CDOs. In connection with this transaction, CDS contracts on purchased Multi-Sector CDOs will be terminated. AIG will provide up to $5 billion in subordinated funding and FRBNY will provide up to $30 billion in senior funding to the financing entity. As a result of this transaction, AIG's remaining exposure to losses on the Multi-Sector CDOs underlying the terminated CDS's will be limited to declines in market value prior to closing and its up to $5 billion funding to the financing entity. As with the securities lending program, FRBNY and AIG will share in any recoveries in the market prices of assets. AIG will continue to have exposure to CDS contracts on Multi-Sector CDOs that are not terminated. As AIG winds down its Financial Products division, it will also have exposure to other types of remaining CDS contracts, which have generated substantially smaller total collateral demands than the CDS contracts on Multi-Sector CDOs. Taxpayers will benefit from the transactions with AIG as follows: fees, interest and repayment of the FRBNY loan in full, payment of a 10% coupon on the newly issued preferred shares, cash payments from the assets purchased by the two financing entities and potential asset appreciation in the underlying securities held by those entities. Taxpayers will own 77.9% of the equity of AIG and will hold warrants to purchase an additional 2% equity interest, and so will benefit from any future appreciation in AIG shares. AIG will also continue to participate in the recent government program being utilized by many companies for the sale of commercial paper. The Commercial Paper Funding Facility (CPFF) has allowed AIG to reenter the commercial paper market. AIG is authorized to issue up to $20.9 billion to the CPFF and has currently issued approximately $15.3 billion as of November 5. Mr. Liddy continued, "All of these steps, which would not have been possible in September, will benefit AIG, its stakeholders and the American taxpayers. This plan contributes to stabilizing the financial system and provides the opportunity for the public to realize gains on its AIG investment in the future. These measures will also put AIG on track to emerge as a nimble competitor with good long-term growth prospects." "This innovative solution enhances AIG's liquidity position. At the same time, American taxpayers will be fairly compensated for funds lent to AIG, and they will capture the majority of any appreciation in the value of the securities involved in the program in the years ahead." Liddy added, "Today's announcement would not have been possible without the vision and extraordinary hard work, dedication and cooperation of officials from the U.S. Treasury, the Federal Reserve Bank of New York, the Federal Reserve Board and the state insurance departments. On behalf of AIG, I would like to extend sincere thanks to all of those involved in crafting this mutually beneficial solution." I last posted to this blog on Sunday, October 19, and since that time I have been busy researching various items on the stock market, responding to e-mails from educators, and when possible... actually working. 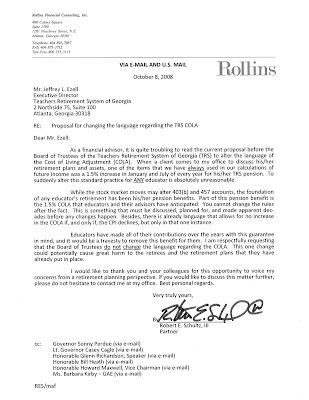 Thank you for your correspondence concerning the proposal dealing with COLAs before the Board of Trustees of the Teachers Retirement System of Georgia (TRS). Time does not permit me to write an individualized response to each of you. I do understand this is an important issue to you. I hope this will help you understand what is taking place. This matter is not before the General Assembly and therefore I do not have a vote in this matter. The Board of Trustees consists of ten trustees whose responsibilities include administration of the fund and to manage the fund so as to ensure the continued fiscal soundness for the current retirees as well as for the current and future members. To date the fund has been well managed and I commend the board for their actions. They have an increasingly challenging job as the make up of the members, their expectations and financial universe evolve. I trust the Board to continue to make wise decisions as they fulfill their responsibilities. The Board consists of the ten trustees. The law requires a majority (six) to be active or retired members of TRS. One trustee is selected by the other nine and shall be a citizen of Georgia who is not a member of TRS but with experience in the investment of moneys. The other three trustees include the State Auditor, the director of the Office of Treasury and Fiscal Services and one trustee appointed by the Governor without restrictions. At the September 24, 2008 meeting of the Board of Trustees, a proposal was made to consider changing the administrative rule that deals with the method by which the Board grants and funds the semi-annual cost-of-living adjustments (COLAs). The current policy, which was adopted in 1969, states that the Board will grant a 1.5% COLA on July 1st and January 1st provided there is an increase in the Consumer Price Index. The proposed amendment states that the Board will determine at its annual meeting each year the amount of COLA up to a maximum of 1.5% that may be granted for the following July 1st and January 1st. It is possible that the Board will take up this proposal at its November 19, 2008 meeting if the Trustees feel they have had the necessary time to evaluate the proposal. If you would like to voice your concerns or ideas to the Board of Trustees before this is taken up you may do so by sending an email to Executive.Director@TRSGA.com. I thank you for you interest in this matter. As Chairman of the Senate Committee on Retirement, I spend a great deal of time and energy working to ensure that the pensions of our employees are safe. It is the intent of the legislature to provide an environment that will allow the experts in finance and pension management to maximize the benefits available to those who have served our citizens so faithfully. Well, at least I have received one response. Nothing much said, but it is a response. I find it interesting that in the "dire" predicament the stock market is in that few people actually do any research on past markets, trends, and outcomes. This market is quite a bit different than many previous problems we have had before due to the issues of credit and globalization. I read an article about Anna Schwartz who co-authored, with Milton Friedman, "A Monetary History of the United States" (1963). It's the definitive account of how misguided monetary policy turned the stock-market crash of 1929 into the Great Depression. She is obviously a brilliant woman that has looked throughout history, but many believe that she may be missing the globalization of the market. She says the issue is confidence and not liquidity (The Great Depression was caused by liquidity). This is true, but she does not feel the U.S. Treasury and Federal Reserve are handling the confidence issue. I think history will eventually show that the Treasury and Federal Reserve are working to resolve every single issue both before and after something becomes an issue. When liquidity was a problem... they injected it. When money market confidence was an issue... they guaranteed it. When we needed worldwide coordination... they orchestrated it. I think looking 2, 3, 5, 10 years out, we will look back and be amazed from where we have been. The markets are powerful machines that are like a cruise ship to turn... they do not turn on a dime. Finally, anyone that started to believe the U.S. was now not the center of the financial universe simply needs to see where everyone looked and returned to for guarantees and leadership. We may not all agree on politics or policies, but it cannot be said that the U.S. Treasury and Federal Reserve have not stepped in to help Americans and foreign companies and nations alike. The trip ahead will be bumpy, but the end should be good for those along for the ride. Just remember - your TRS pension is guaranteed by law, and your 403(b) account is not used on any single day. It is a retirement fund. Frequently investors wonder if now is the time to buy. Most investors want to make sure that they buy when the market is going up. Interestingly though, most great investors think about 2, 5, and 10 years down the line. In Friday's The New York Times, Warren Buffett, arguably one of the greatest investors in the history of the stock market, wrote an Op-Ed piece titled "Buy American. I Am." Below is the article for you to enjoy. Last week I received numerous e-mails about 403(b) accounts and pensions. "How safe is my 403(b)? "; "Will it just go away? "; "If I take it all out what happens? "; "Is the TRS pension guaranteed?" A 403(b) is much like any other type of retirement account - 401(k), IRA, Roth, SEP-IRA - when it comes to investing. Within most 403(b) accounts you have a fixed annuity option, a cash/money market option, and then various mutual funds that you can own. Fixed Annuity - This option allows you to put your money in a "fixed annuity" that generates a return somewhat along the lines of a CD. The exception here is that most fixed annuity investments only let you take 10-25% out of the investment at a time. This is usually not a good investment due to the constraints of taking the funds from the account - even when you are trying to get them out in retirement. While this does not lose money, it also generally only keeps up just above the rate of inflation. Cash/Money Market - This option allows you to park uninvested cash in a place that earns a rate of return that is along normal money market rates. It will not have the return that the Fixed Annuity has, but you can withdraw, reinvest, or hold it without fearing that you cannot touch it (unlike a Fixed Annuity). This is a good place to hold cash for future investments or distributions. Mutual Funds - This option is the one where you will buy shares of a "mutual fund" that owns usually 25-100 stocks. A mutual fund can make or lose money. It is an investment that can go up or down based on the underlying investments in the companies of the fund. Depending on the fund, you may invest in bonds, big, small, or even international companies. Some of the funds will correlate more with the Dow, S&P 500, or Nasdaq, etc. The custodian (AIG-VALIC, Fidelity, Lincoln National, etc.) is not to blame or get credit for the performance of the funds. The funds are run by fund managers that use your money to invest in companies. For example - if you own the "Janus High Yield Fund," the fund is run by a manager from the Janus fund company that will use your money to invest in high yield bonds from various companies. What I would like to stress here is that your 403(b) investments should depend on your age, risk tolerance, and goals. In coordination with your TRS pension, your 403(b) is a powerful tool when used correctly, and it can help you realize some of your dreams after you retire from education. There is a huge difference though between making sure you do not want to lose any money and making wise investments. Know your risk tolerance and expectations. Also, rolling over your 403(b) to an IRA is fine (if you can), but taking all of your money from the 403(b) as a distribution creates a taxable event that can have huge tax implications. Do not take a distribution without first talking to an accountant or financial advisor. It could cost you 35-45% in taxes! There are many things to consider when you start thinking about your TRS pension benefits, but one of them is not if the fund will be there. As of June 2007, the pension fund was worth $53.3 billion, and it paid out about $2.2 billion with about $1.7 billion in contributions. Thus, only about $0.5 billion was taken from the fund in FY 2007. The fund, as of June 2007, was "balanced" with about 62% in equities and 38% in cash and bonds. TRS has not yet released the June 2008 figures, but even with the declines in the stock market, the fund is viable and continues to be reevaluated every year by auditors and actuaries. In June 2009, the employee and employer rates of contribution will rise slightly due to past stock market performance. This increase is to insure the benefits that have been guaranteed to educators. One important thing to remember is that the TRS benefit is guaranteed by Georgia law. It is not just a guideline but a law. One additional item on your pension benefits - TRS is proposing a change to the Cost of Living Adjustment (COLA). It is absolutely imperative for all educators - current and retired - to write a letter to TRS asking them to NOT change the wording as the proposal requests. The wording that would change could and most likely would ultimately change your pension benefit. GAE and PAGE are both against this action, and I cannot imagine an educator that is for the change. My post, TRS Board of Trustees to Vote on Cost of Living Adjustment (COLA) Change, on the proposed change includes a my comments and a copy of the letter that I sent to Jeffrey Ezell, Executive Director of TRS, last week. I hope your school year is going well, and please e-mail me if you have any questions. Are We Hitting the Bottom? There have been several questions e-mailed to me over the past couple of weeks, and one that continues to be asked is "Are we hitting the 'bottom'"? There is one thing that I have learned from reading history books, economic books and articles, and listening to people... the bottom is never "the bottom" until a few months later. In October 2002, the market hit "the bottom", but no one knew it until 3-6 months later. The reason is pretty simple to understand but hard to see. We have all heard the expression "he can't see the forest for the trees", and this is the perfect time for it. It is relevant here because all of us see only what is in front of us. We cannot tell if the market's last drop will be the last one or if we should head for the door. Our current bear market from October 2007 to present leaves us down about 42% from the high. Thus while we may not be at the ultimate bottom, we are somewhere near it. The next few months could be choppy in the markets, or there could be the "V" bottom that sometimes happens. The main thing to do is keep your emotions in check and have your allocations at what you feel comfortable with. If you sold some assets (hopefully not all) to cash because you are worried, look to keep it, and slowly put it back in. Going all in may be brilliant or it may not, so the diversification and long term aspect is something to remember when markets start to act crazy in the future. UPDATE - October 14 - TRS has placed a memo on their website regarding the proposed change. Please read the memo. On September 24, 2008, the Teachers Retirement System of Georgia (TRS) Board of Trustees held a scheduled meeting with members of various educator advocacy groups (GAE and PAGE) present. During the meeting, the Chief Financial Office in the Governor's Office, Tommy Hills, proposed a change in TRS board policy regarding the semiannual Cost Of Living Adjustment (COLA) for both current and future retirees. The current policy has been in place since 1969, and it states that TRS “shall give” its members a 1.5% COLA in January and July of every year. The Governor's office wants to change that policy to “may give” a 1.5% COLA in January and July. Under the new plan, the Board of Trustees for TRS would vote each May on changing the COLA and possibly how much the COLA should change. From what Mr. Hills said, this would bring the TRS in line with other Georgia retirement boards. After a discussion, a vote was taken by the seven members who were present. Three members supported the measure and three opposed it. Acting chairman Russell Hinton broke the tie by voting in favor. The proposed change must be “on the table” for 30 days before any action can be taken. The TRS does not meet in October and the next meeting will be November 19th when they will vote on the proposed change. Based on this information, I personally wrote a letter to Mr. Jeffrey Ezell (Executive Director of TRS) asking him to have the Board of Trustees not change the current wording of the policy. Please see my letter below - click on it to enlarge it. I would like to ask each of you to please do the same and write TRS to let them know that you are not in favor of any change to the policy. Hopefully together with GAE and PAGE, we can all make a difference so Georgia does not alter the semiannual COLA. To e-mail all of the important individuals (Jeffrey Ezell - Executive Director of TRS, Governor Perdue, Lt. Governor Cagle, Speaker Richardson, Tommy Mills - CFO, Senator Heath, and Representative Maxwell) with just one click - please click here. From GAE - Georgia Association of Educators - You must be a member. While this may be news, the actual contribution change will be very, very small. For example, under the current rates (5.00% and 9.28%), an educator making $50,000 a year would make contributions of $2,500 (annually), and the employer would contribute $4,640. Under the new rates (5.25% and 9.74%), an educator making $50,000 a year would make contributions of $2,625 (annually) - only $125 more. This would have a net effect on your paycheck of about $7.30 per MONTH. The employer will have contributions of $4,870 - $230 more. The reason for the change goes back to the performance of the stock market since 2001. TRS has an actuary determine the liabilities versus assets of the plan and calculate the difference that must be made up. The raise in contributions will help bring the plan back in line. If you wish to know more, please read the letter from the TRS Executive Director Jeffrey L. Ezell by clicking here. I have been e-mailed several questions over the last few days, and one of the main points that everyone wants to know is "Is my 403(b) safe?" While I have written about the safety of the 403(b) from a bankruptcy point of view (specifically AIG VALIC), I have not written anything specific about the actual account and its investments. What I have tried to preach in this blog is simply diversification. This market is actually somewhat the exception and not the rule. During any "bear" market, there are usually areas in the market that are down, and there are some that are up. Diversification usually allows you to make sure to grab some of all of the areas to help you in an up and down market. The 3rd quarter was different because every area of the market was down... even bonds. The main thing here is that diversification is your friend because most of you do not watch the market every single day, but as the saying goes, you need to be able to sleep at night. For example, a few years ago, I had a couple of clients call me that had several million dollars invested, but for them, safety was the $100,000 in cash in the money market that I held. This "let them sleep at night." A 403(b) account is just like any other account that invests in the stock market. You CAN lose money, but the issue is not to make your account 100% safe, but to invest it for the long term. At the same time, if you need to feel better and have some in cash "to sleep at night," then by all means, go ahead. The market and economy do look rough in here, and a 20% cash position or so in the money market seems to be a decent place to hide. I would not use the fixed annuity since it locks up your money. Everyone is different though, so you need to do some research, and understand your options rather than just trying to jump on something hot. If you go to cash in the entire account and wait for the market to get better, then you may miss a golden opportunity. I will close this post with several quotes from the "Oracle of Omaha" Warren Buffett. Remember, he just bought stakes in Goldman Sachs and GE. He is not looking for today or tomorrow, but for years from now... He has billions though, so you want some safety (cash in the account) and do not go overboard. "I never attempt to make money on the stock market. I buy on the assumption that they could close the market the next day and not reopen it for five years." Good luck, and keep e-mailing me with questions. On Friday, AIG Retirement seems to have released a press release from its President and CEO Bruce R. Abrams explaining that VALIC would be one of the properties sold by parent company AIG. This news does seem to fit in with the previous press release e-mailed to me directly by AIG and posted on the website on Friday. This does not mean that anything will change with VALIC or the investment options you have in your 403(b) accounts, but it is worth noting that a change does seem in the cards. As I have previously stated, the change should most likely be nothing more than a "branding" change with AIG Retirement's name changing to that of the purchasing company. This is similar to a bank being purchased by another bank, and it is no reason to be alarmed. You can find the press release that was e-mailed to me by a visitor to the website by clicking here. As information becomes available, I will post more information about changes. Out of the Blue - AIG Press Release? Whenever I write anything on this blog, I do try to research it as thoroughly as possible. I do searches, watch interviews, etc. I have never had a company or someone just e-mail me something... until this morning from AIG. The following is the press release sent to blogs like this one from AIG. We apologize for sending this to you as a mass e-mail distribution, but we thought you would want to receive this as soon as it came out, since you and your readers have been following this story closely. NEW YORK, October 3, 2008 - American International Group, Inc. (AIG) today indicated its intent to refocus the company on its core property and casualty insurance businesses, generate sufficient liquidity to repay the outstanding balance of its loan from the Federal Reserve Bank of New York and address its capital structure. AIG had drawn $61 billion on the Fed credit facility as of September 30, 2008. AIG plans to retain its U.S. property and casualty and foreign general insurance businesses, and to retain a continuing ownership interest in its foreign life insurance operations. AIG's worldwide property and casualty businesses generated $40 billion in revenues in 2007. The company is exploring divestiture opportunities for its remaining high-quality businesses and assets. AIG is also actively at work on a number of alternatives for its Financial Products business (includes VALIC) and its securities lending program. AIG Chairman and Chief Executive Officer Edward M. Liddy, said, "We are refocusing on our traditional strengths in property and casualty underwriting. We have a number of remarkable businesses with leading market positions and significant competitive advantages that could not be recreated today." "To realize our objective we will sell a number of extraordinary businesses that are already proving to be highly attractive to buyers," Liddy said. "We have already been contacted by numerous strong, stable parties, and we expect the buyers will recognize the value of these properties, be a good strategic fit and offer the greatest potential for growth, profitability, and continuing opportunities for employees. Our goal is to emerge from this process as a smaller but more nimble company that is solidly profitable and has good long-term growth prospects." AIG's global coordinators for the divesture program are The Blackstone Group and J.P. Morgan. What Does This Mean for AIG-VALIC Retirement Accounts? Well, at the moment nothing. It does seem to point to the fact that AIG may be selling its VALIC unit, but to who we do not know. I would agree with the statement that AIG does in fact have several very profitable lines of business. In fact, it was only due to the mortgage related securities that AIG was even effected at all. AIG is working with two of the most respected names in industry to work out its issues with JP Morgan and The Blackstone Group. I would imagine that there have been and will continue to be numerous discussions about what business units may be divested (sold). I will continue to look for information on AIG and especially VALIC, and as I receive it, I will post it and comment as necessary. Today's big story... get the financial bill passed in the House. How to Look at Your Entire Portfolio - Pension, 403(b), Real Estate, etc. Whenever a new client comes to my office, I always ask them to bring any relevant account statements, tax returns, etc. We discuss each one and make a list of assets and debits. 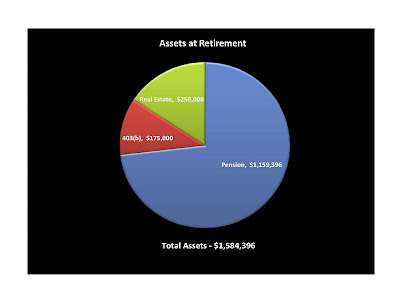 From there, we can start to really get a picture of the financial portfolio of the client. I think that sometimes it is hard for many people, including educators, to understand that their pension has a current value beyond just the monthly payout in retirement. This is something that I am frequently asked about by educators, so I hope this post helps explain it. Let me give you an example. Let's say that you are set to retire after 30 years, and the last two years you made $65,000 each year. In Georgia, your pension payout would be $3,250 ($39,000 annual) a month with a 1.5% cost of living adjustment every 6 months. Since this is essentially an annuity, let's estimate that you will live for 40 years. Factoring in 480 payments, the $3,250 to start,the 1.5% increase every six months, and the TRS return of 4.5%, you would need to purchase an annuity for $1,159,396 today. Yes, that is more than $1 million. Now that we have the value of the annuity, let's look at the other assets - a little 403(b) of $175,000 plus a paid for house of $250,000. Without knowing it, you have a net worth of $1,584,396. See the chart below (click it to enlarge). Now that we have valued your pension and totaled your assets, you can start to see why your 403(b) being invested is a smart move. The pension portion is considered "fixed income," thus it is very stable and predictable. The real estate portion (your house) does not generate income, but it is also a substantial asset that has a significant value. Your 403(b) - which you should rollover to an IRA - is actually your least valuable asset, and it is one which it should be used to complement your pension. By leaving it invested in equities and slowly drawing it down, you allow the 403(b) to weather any moves in the market and to continue to gain in value for our future use. You can read in many books about moving your assets to fixed income as you approach retirement, but this is generally meant for 401(k) participants. Since the vast majority of your assets (your pension) is already considered fixed income, you are looking at only 11% of your assets being invested in equities. This is well within a range of acceptability. Keep investing, keep asking questions, and keep wanting to learn more about your financial future. Since my previous "Is My 403(b) Safe?" post, there have been hundreds and hundreds of visits to the website and numerous e-mails asking questions - I hope I have helped. This is obviously an important topic, so I decided to add a second section to the blog. It was not even two weeks ago that I wrote the previous blog discussing 403(b) accounts held at AIG VALIC. In that time, the financial world has continued to change, and on Monday, the Dow had its largest one day point drop in history with 777 points. What I want you to remember now is that this account is for your retirement and the rest of your life, not today. There are several dozen vendors that have 403(b) accounts, and I have not heard of one going out of business. As for the case of AIG-VALIC, the company could change soon. I am not sure it will, but the VALIC accounts may be a one of those assets that is purchased by another company as AIG is sliced up and sold off. This does not mean that you are losing your account!! It just means that someone else will be the company you do business with. This is just like your bank being bought by another bank - i.e. Wachovia purchased by Citigroup. Your money and accounts do not disappear, but the name will change. If you have left teaching or the county you started the 403(b) in, by all means please rollover that 403(b) to an IRA. In an IRA, the asset choices are better, the fees lower (annuities charge about 1.35% per year with NO additional services), and the services you can receive for your account make it all worthwhile. If you have not, look at the various options you have. This is not the time to stop contributing to the account, but it is a good time to look at your investments (tomorrow I will discuss how to value your TRS and 403(b) together). Remember your pension from TRS is guaranteed and should be considered a fixed income security when looking at your overall portfolio. If you are young with 10+ years to retirement, the diversification, time, and your continued contributions will be enough to help you weather any momentary blip. If you are less than 10 years from retirement, then this is something you should really talk to someone about - your goals, feelings, level of risk, etc. I would not transfer money into the fixed annuity side - this just locks it up for the next 4+ years - this is not a good investment. The money market is better than that since you can move it back to the equity investments at any time. The main thing here is that your account is safe as to the possibility of losing all of your assets based on a company going under. You are invested in mutual funds that are regulated by the SEC that own dozens of companies within each. This does not mean that you cannot lose money, but just as the market goes up sometimes it will go down. The long term benefits though have been tremendous. A quick glance back at history shows that as we have reached the current "modern era" of investing, the recessions and bear markets have become shorter with bull markets that have become longer. No one knows when the bottom will be, but if you sell out now, you are locking in losses with no potential for gain. The only people that lost money on October 19, 1987 were the people that sold out. The market rebounded over the next 6 months, and the economy and markets had a tremendous bull market rising 650% over the next 21 years. I cannot say that we will have the same return, but if you look at your pension as the foundation of your retirement and the 403(b) as the "extra" money, you can benefit from being invested. Just stay diversified (have I preached it enough? ), get advice (from a professional - not your neighbor), be smart about your money (rollover old 403(b) and 401(k) accounts to an IRA), and you will be much better for it. If you have any questions or just want to chat, always feel free to e-mail me.